Monday, 1. October — Thursday, 1. November. 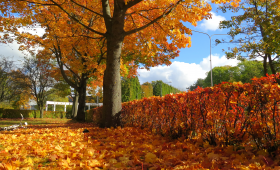 The golden autumn has arrived in Ventspils! The city is covered in yellow, fiery red and brown colour tones. The warm autumn tones are just calling to go out to the nature and enjoy the wonderful landscapes. To make the autumn days even more colourful, enjoy all the nuances this season has to offer by going on exciting walks, bicycle rides or on picnics with family and friends. Weather forecasters are promising a particularly sunny and warm upcoming weekend. For those, who want to spend their weekend in nature, Ventspils Tourism Information Centre recommends a colourful bicycle ride on the city’s cycling routes, which is already 60 km long, allowing planning the trip to different places. You can go on a bicycle ride around the city or discover something new while going for a ride around Būšnieku Lake. You can get to know the autumn toned reeds and the flora and fauna living on the lake while going on the foot-bridge and on the viewing platform in the lake’s swampy area. A comfortable picnic spot is also available for relaxing on the Būšnieku Lake territory. Ventspils Adventure Park will provide a great and active leisure activity for the whole family that will be especially appreciated by the smallest ones, trying out some of the 20 diverse attractions. But if you climb up the hill, from its top a magnificent view of the city over the colourful tree tops. In the summer, Ventspils is coloured with various colourful flower beds and sculptures, while in autumn the parks and squares are painted full of golden trees. One of the city’s residents and visitor’s favourite place to go on walks is Reņķa garden – during the walk you can see the interesting and impressive sized objects that will definitely be exciting for the children. A picnic with a basket full of sandwiches can create beautiful autumn mood for a family. For those who want to feel the presence of the sea and the touch of the wind during their walks, we recommend going to the Seaside park, where the Jungle trail can be found with attractions for children, as well as the Anchor trail – a unique opportunity to see the largest anchor exposition in the Baltics. The biggest anchor is 23 tonnes heavy, six metres high and 4.5 metres wide. Alongside the autumns colourful scenery you can have a great time while going on a ride on Mazbānītis. While enjoying the autumn in Ventspils, on your walk you definitely have to include the newly renovated Southern Pier. The wind, sun and the view of the Blue Flag Beach will allow you to take beautiful autumn photos.